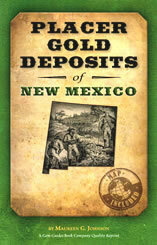 A straightforward, no-nonsense guide to the locations where placer gold deposits have been discovered in New Mexico. Accompanied by a large 20.5" x 24" map with reported gold-bearing areas highlighted. 46-page paperback, 5.5" x 8.5".